You'll recall that I wondered about Sonny's origins. We now think we know who made Sonny. At first we thought he might be a Mack figure. There are similarities in the paint blending that resemble Mack's work. But the control linkages are unlike any Mack I've seen, so we wondered. 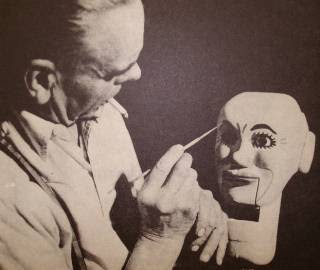 Ventriloquist, collector and historian Tom Ladshaw suggested that Canadian figure maker Len James might have been the builder. This kind of fits because Frank Merryfield, the ventriloquist who originally owned Sonny, was a Canadian. Tom dug into his picture archives and came up with this picture of James working on a figure. The similarities in carving and paint details are close enough to Sonny's that we can safely declare Sonny to be a Len James figure. Mystery solved. Sonny's new face is cast and under assembly. Here's a picture of the old Sonny alongside the beginnings of the new Sonny. There are some changes to the plans. Originally, I intended to make the copy as close to the original as possible. First, I decided not to replicate the under-the-jaw leather patch on the copy. They are difficult to install, look shoddy up close, and, over time, wear out. I had to remove the patch from the original Sonny to make the mold, so I'll have to replace it. Every indication is that the patch I removed is not original. It and the neck has been repainted. and the paint does not match the other flesh tones. Figure makers in the old days used that neck patch to cover the hole under the jaw on woodcarved figures. Mack, Marshall, and others employed the patch device. It worked fine because ventriloquists worked onstage under bright lights. Audiences did not notive the patch. But you can see it in closeup snapshots of Jerry Mahoney and other vintage figures. Precedent exists for replacing the patch with a sculpted neck when making a cast replica. 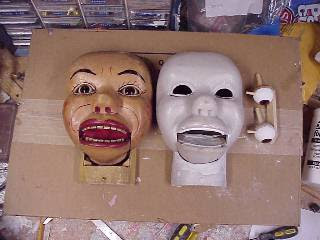 The Jerry Mahoney replicas made first by Ray Guyll and now by Jerry Layne have a sculpted neck. Observe the necks of the two heads in the photo. The original has a gaping hole where I've removed the patch. The replica has a sculpted neck. Michael Harrison, Sonny's owner, asked that the replica have moving eyes. The original does not. Thus the eye assembly in the photo. There are other changes that become evident as the project continues. I'll discuss them later as the project continues.